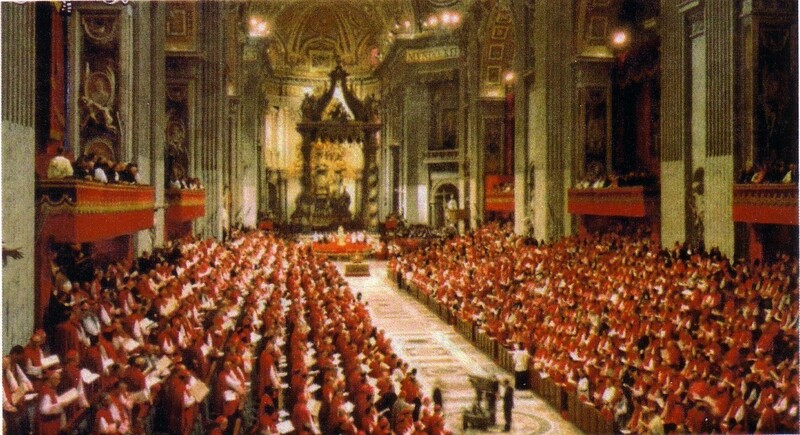 Sacrosanctum Concilium is by far the more influential and groundbreaking of the two documents. Whenever I ask students if they can say something about how Catholicism now is different from how it was 50+ years ago, what they most usually come up with are liturgical changes: mass in the vernacular and the priest facing the congregation. Beyond this, the scholarly work available on Sacrosanctum Concilium is immense, erudite, and contentious, leading to a rich dialogue about its implications. However, I think Inter Mirifica is more significant than its detractors claim. Now on its anniversary, it deserves both reconsideration and reevaluation. Second, Inter Mirifica begins a shift in Catholic teaching on social communications. While in sections it emphasizes Catholic control of media (emphasized fairly consistently from Vigilanti Cura in 1936 through Miranda Prorsus in 1957), it also emphasizes the importance of formation in media. While this includes the basic level of technical competence (“Priests, religious and laity should…acquire the competence to use these media for the apostolate” – IM 15), more deeply it emphasizes the “formation of Christians” and the development of “a correct conscience on the use of the media” (IM 5). While at the time Inter Mirifica was mostly concerned with the right to information, the rights of art, and the formation of public opinion (IM 5-8), its insistence on the importance of context and circumstance in media provides the needed flexibility for considering issues that would arise later and have an impact on formation (IM 4). Indeed, an examination of the reception history of Inter Mirifica (what Ormond Rush has called “A Hermeneutics of the Receivers”), demonstrates the ongoing and underlying concern for the way social communications shapes and requires moral formation. Third, Inter Mirifica avoids making major proclamations about social communications and instead calls for structures that will help the Catholic Church to think with the changing world of the media. It calls for “a pastoral instruction” on social communications, which was released in 1971 as Communio et Progressio. This document (which I recommend everyone read), provides a rigorous theological groundwork for understanding “communication” as “the giving of self in love” and for seeing the incarnation as the way in which God “communicated his very self” to humanity (CP 10). Inter Mirifica also called for an annual day which “on which the faithful will be reminded of their duties” (IM 18), which in 1967 became the first World Communications Day. Pope Paul VI described this day as an opportunity for the Church to make her own contribution to the orderly development of the world of social communications: a contribution of inspiration, encouragement, exhortation, guidance and cooperation.” Lastly, Inter Mirifica called for “a special office of the Holy See” that would oversee the Church’s engagement with social communications” (IM 19). This became what is now called the Pontifical Council for Social Communications, which has continued to produce insightful and timely meditations, documents, and instructions on the media. Ultimately, I think that Inter Mirifica’s brevity and limited scope are among its greatest assets. The types of media it was most concerned with were the press, the cinema, radio, and television. In 1963, there was no cable television, no internet (not even ARPANET), no mobile phones, no texting, no Facebook, no Twitter (i.e., no @Pontifex). Providing overly specific or definitive statements about the media in 1963 may have rendered the rest of the message obsolete. While it’s possible Inter Mirifica could have said more, I think it’s a gift that it did not say too much. Indeed, what it does say – the profound significance of social communications, the necessity of formation in light of the media, and the need for ongoing structures for thinking about social communications as the world grows and develops – are important enough on their own. I was pleasantly surprised by Inter Mirifica when I studied it as part of an online discussion some years ago, especially recalling it in historical context. (Partly surprised because I’d never even heard of it.) I remember being struck by the discussion of broadcasting Mass for participation by those who were ill or homebound, because that’s been something I’d just taken for granted. And I too was pleased by the discussion of formation and responsible choices in consuming media. “Social media” sure has changed a lot in those fifty years, though! I hope the next council, whenever it might be, will take up the topic again. America magazine is co-sponsoring a forum on Catholic media on the 50th anniversary of Inter Mirifica. More details here: http://americamagazine.org/service-word. All are invited! Thanks! I’ll be sorry to miss it. Thanks for this. I truly learned a lot!